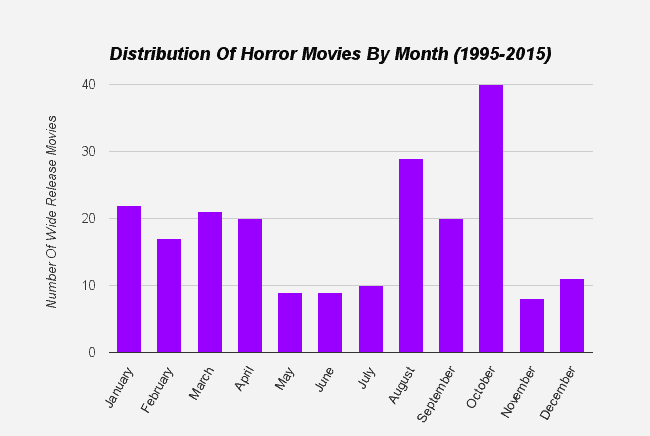 Monthly Distribution Of Horror Movies – During What Period Of The Year Are Most Horror Movies Released? – Where's The Jump? Monthly Distribution Of Horror Movies – During What Period Of The Year Are Most Horror Movies Released? The graph below shows the total number of horror movies released each month from 1995-2015. Only movies that were released in a minimum of 1,000 theaters in the USA are counted. Obviously Halloween leads to October being a very popular month for horror movies with almost twice as many horror movies released than any other month. January and February are known as the “dump months” in the movie industry because a combination of factors (awards season, inclement weather in the USA, and sporting events such as Super Bowl) lead to reduced consumer spending on movies. As a result low budget genre films – typically action, horror, and comedies tend to dominate the release schedule during this time. May to July is the lucrative “summer season” for movies where good weather and summer holidays for students combine to increase movie attendance. Very few horror movies are released during this period because they tend not to have wide appeal across all demographics and therefore a much lower potential maximum than the typical summer blockbuster. Still, the occasional horror movie is released during this time when demand is anticipated to be high typically for a movie based on a book, a remake of a well known horror movie, or the continuation of an established franchise. Movies released during the summer months in recent years include: Poltergeist (May 2015), 1408 (June 2007), The Omen (June 2006), The Conjuring (July 2013), and The Haunting (July 2009). November and December are also a quiet time for horror movies due to a combination of horror movie burnout following Halloween, and the fact that the release schedule is dominated by Oscar contenders and, in recent times, big budget movies looking for an alternative release to the summer period.